I was planning to write another installment in my series of posts on the savings-investment identity in which I have been working through and summarizing Richard Lipsey’s essay “The Foundations of the Theory of National Income.” Perhaps I will get to my next installment later this week. If not, then I hope to do so early next week. But it occurred to me that the best way to explain why saving is not identical to investment is by framing the discussion in terms of the familiar circular-flow schematic model of income and expenditure. 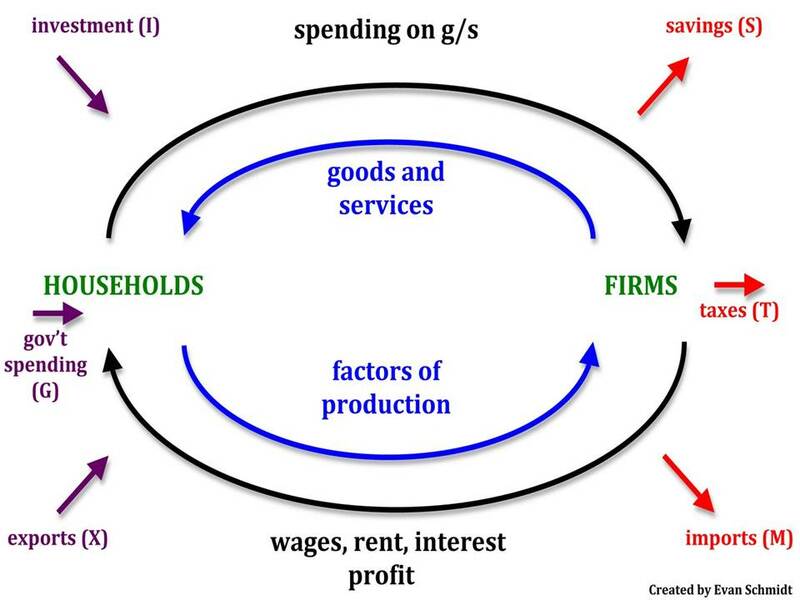 The accompanying diagram is a typical representation of the circular-flow model, with a government sector (government spending and taxes) and a foreign sector (exports and imports) included in addition to just investment and saving. As indicated by the arrows in the diagram, investment, government spending, and exports are added to the circular flow while savings, taxes and imports are withdrawn from the circular. In the conventional terminology, investment, government spending and exports are injections, and savings, taxes and imports are leakages. And, of course, a basic property of the model is that injections and leakages are equal. It is only in the simplest model, with no government and with no foreign sector, so that there is just one injection (investment) and one leakage (saving), in which the familiar equality between investment and savings holds. So the question that I want to ask now is simply this: is the equality in the simple one-sector model between injections (investment) and leakages (savings) an equality that may or may not be true, or is it an identity that must necessarily be satisfied in all places and at all times? Well, rather than try to argue this through in terms of abstract economic or accounting reasoning, let’s think about it in terms of a simple physical analogy, one that we could actually demonstrate for ourselves in our own homes. So think of a bathtub with some water in it. Depending on the size of the bathtub and the amount of water in the bathtub, the water will reach some uniform height in the bathtub. Let’s call that uniform water level an equilibrium. It’s an equilibrium, because if that’s all the water there is in the bathtub, and we don’t let any water out of the bathtub, and, for purposes of our little thought experiment, we ignore any evaporation, that water level will persist indefinitely, with no tendency to change. No water in, no water out, and you have a constant water level. In other words, with no injections and no leakages, the water level of the bathtub is stable; it does not change. The water level is in equilibrium. But if you turn on the faucet and water starts to flow into the bathtub, the water level will start to rise. As long as water is being injected into the bathtub, the water level will keep rising, and the water level will not be in equilibrium. However, if you unplug the drain to the bathtub, water will start flowing out of the bathtub. What happens to the water level? That depends on whether water is leaking out of the bathtub through the drain faster than water is being injected into the bath tub through the faucet. If injections are greater than leakages, the water level will rise, and if leakages are greater than injections, the water level will fall. And if, by chance or design, injections are exactly equal to leakages, then the water level will be stable and back in equilibrium. Thus, the condition for a stable water level is that injections be exactly equal to leakages. When injections into, and leakages from, the bathtub are equal, the water level of the bathtub is in equilibrium. When injections are greater than leakages, the water level rises, and when leakages are greater than injections the water level falls. So, if you believe that investment and savings are identically equal, please tell me whether you also believe that injections and leakages are identically equal. And if you do believe that injections and leakages are identically equal, please explain to me what the difference is between the circular-flow-of-income model with injections and leakages identically equal in equilibrium or out of equilibrium and the bathtub model in which the water level can change only insofar as injections and leakages are not equal. Temperature. Hotter water takes more space than cold. Ergo….until water becomes frozen, in which case it also expands. So, equilibriums can vary depending on temperature. I want to make a slight modification to your (textbook) analogy. Suppose the water level moves from low L to high H.
Use some numbers. Measure L and H in inches off the bathtub floor level. Suppose L = 12 inches and H = 18 inches. Suppose the water level moves from 12 inches to 18 inches. Injections of water are (H – L) = 6 inches. This is a measure of the increase in the water level. A positive increase is an increase. Leakages of bathtub air exposure are (H – L) = 6 inches. This is a measure of the decrease in the height of bathtub wall that is exposed to the air. A positive decrease is a decrease. Suppose the water level moves from 18 inches to 12 inches. Injections are (L – H) = (6) inches. This is a measure of the increase in the water level. A negative increase is a decrease. Leakages are also (L – H) = (6) inches. This is a measure of the decrease in the height of bathtub wall that is exposed to the air. A negative decrease is an increase. Injections are equal to leakages identically, in or out of equilibrium. In other words, the changes in the bathtub water reflect equivalent injections and leakages. This is assured through double entry bookkeeping of changes to the levels of investment and saving flows. (I and S are income statement flows). It is not possible for the economy to invest more without an increase in saving and it is not possible for the economy to save less without a decrease in investment. Investment creates saving through payment to the factors of production. An attempt to reduce saving creates disinvestment as a matter of business response to undesired inventory gluts. It is the consequent reduction in total investment levels that allows planned saving to be achieved in the form of a decline in realized saving. And the multiplier can only work incrementally through double entry bookkeeping. If textbooks analogize injections to an increase in bathtub water levels and leakages as a decrease in levels, then the textbooks are wrong. The suggested water level/tub air exposure analogy is analogous to the quantitative equivalence of investment and saving, and of injections and leakages. Investment is not the same thing is as saving, but their quantitative equivalence is forced by the double entry bookkeeping that records the events of both. The same holds for injections and leakages. And an increase in the bathtub water level is not the same thing as the decrease in the exposure of the bathtub wall to air. But they are quantitative equal by identity. And if one throws an 8 foot x 8 foot blanket on the ground, the blanket is not the same thing as the ground that it conceals. But they are quantitatively equivalent areas. An interesting aspect of this is that there is an apparent asymmetry in the semantic suggestion of the terms injection and leakage. The question becomes: injection relative to what, and leakage relative to what? The injection I is relative to C such that C + I = Y. The leakage S at least has the appearance of being relative to Y such that Y – S = C.
But an injection I results in an increase in the leakage S. So injections and leakages increase (and decrease) together. Unlike the semantic connotation, the leakage in this case is not a reduction in Y, but an increase in Y. This semantic dysfunction doesn’t fare much better in the operation of the multiplier. The story I believe is that an injection of I will cause consumption spending from the income that has been paid to the factors of production. If the MPC is 2/3, then the first iteration after $ 100 of investment will be $ 66 2/3 of consumption spending. The leakage is presumed to be 33 1/3. But there is no actual leakage. There is only leakage relative to the counterfactual of $ 100 of consumption spending, which is not actual leakage. And because there is no actual leakage, there is no additional saving created in this or any subsequent iteration of the multiplier. All of the saving was created with the original investment injection. For example, if that saving shows up as a bank balance, the operation of the multiplier shows up subsequently as a function of the velocity of that bank balance in chasing consumer goods and services. There is no further saving. And everything works in reverse in a receding economy according to the same preservation of the investment saving identity. Injections and leakages can also be seen from the perspective of the balance sheet of the entire economy. Investment injections result in debits (increases) to assets. Leakages become credits (increases) in net worth (which is the balance sheet result of saving). These are on opposite sides of the economy’s balance sheet but they are equal in quantity. I was going to leave this, but you’ve drawn me back in again. First off, I think stuff about injections and leakages is not a great way of talking about economics (perhaps I feel about this the way you do about the Keynesian cross). The bathtub analogy is all wrong in terms of what’s what. It should be a big clue that the flow of water (in or out) is a flow concept (obviously), measured in volume per unit of time, whereas the amount of water in the bathtub is a stock concept with no time dimension. The amount of water in the bath cannot possibly be analogous to income which is a flow concept. The problem is there is no circular flow at all in your description. To relate to an economy, we need water to be going round in a circle, such that the speed of flow represents income. Injections and leakages then relate to water that is added to or drops out of circulation, thereby changing the rate of flow. Leakage therefore doesn’t mean the water that flows out the bottom; it means the difference between the water that flows in and the water that flows out, i.e. the retention of water by the bathtub. If we think about what saving means, this should be obvious. Provided we then have a properly closed system any difference in flow in the bathtub must be exactly offset by a difference in flow through some other container in the system. But if I define both “inflow” and “outflow” to be “net change in qty of water” then clearly they will always be the same by definition. However if I want to understand the bathtub model then what I need to work out is what determines the inflows and outflows as defined the first way. The fact that they are always equal as defined in the second way is no help at all in doing that. LAL, Thanks for the links. You are right that Krugman probably gives too much credence to the accounting identity, but I think he’s on the right track. Benjamin, I agree temperature can cause a change in the water level, but my example was intended to abstract from those kind of effects. JKH, I am sorry. A leakage is water leaving the bathtub. That is a real physical phenomeon that can be measured at the drain of the bathtub. An injection is a real physical phenomenon that can be measured at the faucet. If you choose to define leakage and injection in such a way that makes the identical, you have every right to do so, but don’t think that you have thereby the clear physical reality that everyone else is capable of observing. Nick, Forgive me for enticing you back into a discussion that you wanted to abandon. I am well aware that the water in the bathtub is a stock. The mere fact that it is a stock and not a flow like income does not mean that there is no analogy between leakages from and injections into the bath tub and leakages from and into the flow of income. Instead of a bathtub, we could talk about a river like the Mississippi. There are injections into the Mississippi every spring from the melting snow. Those injections cause the rate of flow of water in the river passing at any point on the river to increase and the water level of the river to rise, because the rate of leakage from the river as it enters the Gulf of Mexico does not increase as fast as water is being injected into the river upstream. If the circular flow of income is increasing, something that can be measured at any point in the circular flow, what accounts for that increase if it is not that income or expenditure is being injected into the flow at some point faster than it is leaking out of the circular flow at some other point? Rob, Yes, that’s exactly right. Why should one set of possible definitions be allowed to tyrannize over another set that is at least as legitimate and more reflective of the phenomenological reality of the situation. I know how a bathtub faucet and drain work. That’s not the way the economy works. Either you state whether accounting identities are valid or whether they are not. You are saying both the things simultaneously. But your error is more involved than that. The saving investment identity is where saving is the total saving of all sectors and the same with investment. For a closed economy these are equal. For open economies you have to consider the world as a whole. You cannot mix definitions. These are basic errors. JKH, My point was that your proposed definitions of leakage and injection had no relation to the underlying phenomenon described by the bathtub model. Why is it inconceivable that there could be definitions of saving and investment that would allow them to be unequal out of equilibrium, thereby elucidating the dynamic process by which income in the circular flow model changes? Ramanan, Very few people any longer believe that there is only one correct definition of anything. All I am saying is that to insist on defining saving and investment so that they are identically equal causes severe problems in the conventional macroeconomic theory of aggregate income. Defining savings and investment so that they can be unequal, just as injections and leakages may be unequal in the circular flow model of income, avoids those problems. I think you’re just distinguishing between stocks and flows, right? Income and Expenditure are money in terms of flow. The supply and demand for money are money in terms of stock. Over a given time period you can consumer your income or save part of it. Or you can borrow some from another person and consume that flow as well. Savings = Investment only automatically if the supply and demand for money (which are both for stocks) is constant and does not or cannot change. My income and expenditures are flows. If I save my income I lend it to someone else and then HE spends it. So Savings = Investment. But this assumes that I choose to save and therefore defer my own consumption by handing the cash to someone else, instead of just holding onto it in my treasure chest. And it assumes that if I DO hand the cash (a loan) to someone else, then he spends it and doesn’t just hold it too. The trouble is you are using inconsistent models or incorrect reasoning or both to disprove accounting identities. You should be doing the reverse. The framework for such things is the system of national accounts, flow of funds and balance of payments provided by institutions such as the UN, European Commission, Fed, IMF etc. You may have reasons to reject these but do come up with a new system in which your definitions are made clear. The problem is that you use a mix of standard definitions as well as your own definitions and hence inconsistencies arise from the beginning of such a line of thought. It’s quite conceivable that some people may seek to formulate interpretations of saving and investment that allow these different things to be unequal quantitatively either in or out of “equilibrium”, or in some other way. That’s because this is a perennial subject of discussion in the econ blogosphere. It is inconceivable to me that such interpretations could be correct. My overarching objection has to do with the meta-relationship of economics, finance, accounting, and mathematics. Accounting is mathematics applied to the measurement of economic outcomes. And so I think economics has essential accounting foundations which are effectively ignored by most economists and economics as a sphere of thought. Most economists have never really been exposed to thinking much about how the logic of accounting works. This is obvious. The result is an attitude of dismissiveness that results in the disconnection of economics from its logical accounting foundations. Cutting to the chase, S = I works. It is fundamental. It is essential to depicting a relationship between two things that must be different in substance in a monetary economy, but the same in measure. I have no idea what a “definition” of S or I would look like that contradicted the required definition for coherent and correct accounting. I haven’t seen one. I’ve just seen struggling attempts at interpretations that conflict with the correct definition. Moreover, if one “defines” S and I to be something other than quantitatively equivalent, then one had better make sure that the economy never reaches a state in which they accidently converge. Because that will result in a contradiction. Once they are equivalent for an instant, they will always be equivalent, because correct and coherent accounting for the economy won’t allow them to be different ever again. The economy proceeds in a way that is reflected in coherent accounting one step at a time. The financial system is a construction of accounting entries. To deny that S and I are identically equivalent in quantity is to disconnect economics quite profoundly from how the real world works. I understand enough about basic Keynesian ideas such as the multiplier and the paradox of thrift to know for certain that these ideas can be easily represented while using coherent accounting. In particular, the identity of S = I in no way interferes with the interpretation of these ideas. It in no way interferes with the notion that “plans” may not be realized. What that identity does interfere with is the erroneous textbook descriptions of dynamics around such Keynesian type processes (or any others for that matter). Economists are dismissive of the fact that accounting as a type of mathematics has a coherent dynamic of its own. In fact, attempts to change the definition of saving and investment are exercises in the fallacy of composition, because they cannot end up in a place that is coherent with respect to measuring results or possibilities for the economy as a whole (in or out of “equilibrium”). OK, that’s very smart with the Mississippi analogy – making it all about flows. But it’s still all wrong in terms of what’s what. In a closed system, we can’t have things just being added and taken away. Looking at the diagram in your post (ignoring the government and foreign arrows), it’s not clear where investment is coming from or where savings are going. The only way I can interpret this is as follows: The black arrow “spending on g/s” between households and firms refers to spending by households with firms (i.e. not investment spending by firms with firms. If we wanted that it would have to be a looped arrow coming out of firms and going back into firms.). This is consumption and represents a lower flow than the black arrow representing wages, rent, etc.. The difference is household saving. The blue arrow “goods and services” represents goods and services provided by firms to households and the value of this is less than the value of the blue arrow “factors of production”. The difference is the accumulation of finished goods and work-in-progress by firms, i.e. investment. To complete the picture, we then really need another arrow going from households to firms which would be net acquisition of financial assets. This will be equal to household savings under the assumptions here. That way, I can make some sense of what’s going on, but there aren’t really “injections” and “leakages” here. Nothing is coming in from outside the system. It would be better to think of various taps in the system that can be opened to different degrees, varying the flow in different channels. I find this hard to translate into your Mississippi analogy. You’ve defined the water level as representing a potential equilibrium. (Faucet) injections add to the level. The two can act in combination to raise or lower the water level. First of all, the water level is a stock in physical terms, but it is intended to represent a flow in economic terms – the production level of the economy. This is awkward, but really isn’t a problem to make that association in an analogy. It is a matter of maintaining a consistent pattern of association when integrating or differentiating either side of the analogy. I have no problem with this. Thus, the physical flow of water in or out of the tub maps to a second derivative economic flow, which is the change in the economy’s output level. So my point is that your representation of a unique directional link to each of injections and leakages is incorrect based on accounting identities that hold at all times. Injections and leakages move in tandem, as I described in my earlier comment. So my response there was to modify the interpretation of the bathtub analogy to correspond to that correct interpretation. This was not a frivolous modification. I think it correctly represents the appropriate analogy in context. When the water level rises, both injections and leakages are increasing at the same rate. When it falls, both are decreasing at that same rate. Investment increases; saving increases. Investment falls, saving falls. This is all consistent with the identities. Investment is “mirrored” by saving. My suggestion was that the measurement of the change in the water level against the bathtub wall (assume injection) was “mirrored” by the measurement of the change in the bathtub wall’s exposure to the air (assume leakage). And I adjusted for signs. This is not a silly exercise. It is an accurate analogy compared to what you presented. It’s not a meaningful response for you to come back and contend that what I suggested is wrong as a representation of the bathtub analogy – when the whole point of what I am saying is that your representation of that chosen analogy is the one that is incorrect. Whether or not it corresponds to boiler plate textbook explanations of the same analogy is neither here nor there as far as I am concerned. It’s an incorrect analogy. So that is not a response. Not in a debate about what is correct and what isn’t. What I have said is that your representation is wrong and I have explained why. Now, having said all that, I have gone back to my own macroeconomics textbook that I used in my MBA program decades ago (1979 David Stager). The discussion of injections and withdrawals takes place almost entirely along the aggregate demand curve – which is basically the planning curve. This is not a bathtub model. The bathtub features realized ex post flows and levels. The AD curve does not. The notion that injections and leakages are first formulated in the planning space before being realized in actual space actually does not contradict anything I have said. But your model does. Let me give an analogy. and that the model gives absurd results, at least that’s what you think. You cannot use it to say the the identity written above is incorrect. The likely reason may be that the assumptions of your model are wrong or there’s some error in the chain of logical reasoning somewhere. The classical theorists resemble Euclidean geometers in a non-Euclidean world who, discovering that in experience straight lines apparently parallel often meet, rebuke the lines for not keeping straight as the only remedy for the unfortunate collisions which are occurring. Yet, in truth, there is no remedy except to throw over the axiom of parallels and to work out a non-Euclidean geometry. Something similar is required today in economics. You are trying to say something like that, but it just isn’t the case here. If you want to say that something analogous to Riemannian Geometry exists you have to first define it. But in your posts, straight lines collide not because they are in a non-Euclidean space but simply because you didn’t draw them straight. Slide 1: I think of the economy in terms of ACTIONS and INVENTORIES. Actions are things that economic actors DO e.g. exchange something for money, manufacture something, destroy something, eat something. Inventories are things that economic actors HAVE. Inventories can be money inventories e.g. economic actor has £30,000, or non-money inventories e.g. actor has three cars valued at a total of £21,000. This slide uses an example to show that four inventories are involved in any economic exchange action. It then relates those inventories to the terms in the C + I = C + S identity. Slide 2: This slide is my version of your injection / leakage diagram. A main difference is that I have represented investment as a NON-MONEY inventory inside the economy, rather than as an injection. My leakages / injections relate to the various actors’ MONEY inventories. This must be correct as the leakages and injections relate to money. A second difference is that my diagram is closed in terms of money. There are no arrows leaving the diagram, so money must be conserved in my diagram. It cannot escape. That’s not true of the standard diagram. Accounting is about conservation. Open diagrams are not. (This is also the problem with the bathtub analogy e.g. where does the water go, where does the water come from?). Slide 3: This slide shows the inventories relevant to the examples where 3 of 5 cars are sold and the business DOES distribute its profit. The identity holds (the values included in I and S are marked on the slide). Both I and S have values of £14,000. Note that the value of the car manufacturer’s money inventory is -£14,000. That is because the car manufacturer spent £14,000 in order to produce the £14,000 of I. Note also that the car manufacturer’s money inventory exactly offsets the rest of the economy’s money inventory. It is the two money inventory values which belong in the injection / leakage diagram. I has the same value as the money inventories but represents two cars which is why it appears inside the main box of my injection / leakage diagram. Slide 4: This slide shows the inventories relevant to the examples where 3 of 5 cars are sold but the business DOES NOT distribute its profit. The identity DOES NOT hold (values included in I and S are marked on the slide). I is still £14,000 as the business still has two unsold cars. However, S is now £5,000 as the rest of the economy has not received the £9,000 profit. Note that the value in the car manufacturer’s money inventory is now -£5,000. It still exactly offsets the rest of the economy’s money inventory. The injection / leakage diagram still ‘works’ as the two money inventories still balance. However, neither of the money inventories has the same value as I. Investment (by business) – Retained Profit (by business) = Saving (by rest of economy). This revised identity would be true irrespective of whether or not businesses distribute their profits. I = S is just a special case where there is no retained profit. Slide 5: The last slide itemises a number of assumptions that I made in thinking through these examples. I think that it is essential to list the assumptions to limit the validity of the conclusions to those assumptions, and also to ensure that the examples need to be rethought if any of the assumptions change. My feeling is that economists use the term ‘investment’ with two completely different meanings: one meaning is a NON-MONEY inventory of unsold stock; the other meaning is a flow of MONEY in the injection / leakage diagram. These two uses are not compatible. Investment is not money. In my examples, investment is cars so has nothing to do with money injections and leakages. Also, many economists seem to view saving as an action rather than as an inventory. That is why people include actions like “save money under rocks” or “store money under mattresses” in their descriptions of a scenario. However, these actions are irrelevant. Also, as discussed previously, there is no consistency used by economists in defining what is included in ‘saving’ e.g. bonds, houses, jewellery. My definition says that only money is saved as only money is the medium of exchange. Everything else is ‘consumed’. Consumption is then valued in terms of money. Ilya, As you point out there are possible scenarios in which the quantity of savings is matched by an equal amount of investment, but there are also situations in which there is no investment to match the amount saved (e.g., when income is used to build up cash balances). Since you provide no examples, I am guessing that you mean that to disprove accounting identities, I should be using incorrect models and inconsistent reasoning. I am not sure that I agree, but perhaps you are on to something. Actually, I am just using very basic definitions of savings, investment, expenditure and income. JKH, I plead guilty to being unknowledgeable about accounting, but I don’t accept that economics and economists in general have ignored accounting. And I don’t understand why you think that you are a lonely voice crying in the wilderness when it is you who have Keynes — one of his many professions was economics, if memory serves – and most economics textbooks on your side in this dispute. And I curious to find out exactly what the erroneous textbook description of dynamics is that you are complaining about. Nick, Suppose that, starting from an equilibrium with savings equal to investment and with income constant, business firms decide to increase their investment, nothing else having changed. Explain to me what happens at the moment that businesses increase their spending, making the initial payment for the new machines or buildings that they want to have built. Has anything else changed besides a payment made by one business to another? Production has not yet increased, no one has been hired, and no additional income has been generated. Has there been any saving to match that investment expenditure? I say that there has been an injection into the circular flow so that injections now exceed leakages and the total income flow will increase until income rises enough so that leakages again match injections. What is your story? JKH, The stock-flow distinction is irrelevant. The same story, as I pointed out in my response to Nick’s earlier comment, could be told in terms of a river, in which you can measure the flow of water passing by any point on the river. If injections and leakages always move in tandem, please explain to me how you can account for a change in the income flow. You say when the water level rises, injections and leakages increase at the same rate. I would like to know what causes the water level in the bath tub to rise, or rate of flow of the Mississippi river to increase so much that it overflows the dykes on the river bank, if water is flowing out of the river as fast as it flowing into the river. Your claim that you have accounted for the rise in the water level in the bathtub by defining injections and leakages to be exactly equal at all times obviously does not explain what causes the water level to rise, something that it obviously explained by noting that water if flowing into the bathtub from the faucet faster than water is flowing out the drain. Forgive me, but I cannot understand how your accounting scheme is consistent with the physical reality that when I want to fill up my bathtub, I turn on the water faucet and plug the drain. Please do me the favor of explaining to me how to reconcile your accounting scheme with the physical process whereby I fill my bathtub with water, and do me the further favor of explaining to me why I am wrong in thinking that I am wrong in thinking that I fill up my bathtub by turning on the faucet and plugging the drain. Ramanan, Please stick with my analogy. Explain to me why I am wrong about how I fill up my bathtub. Jamie, I am sorry, but I cannot respond to your slides now. Perhaps some other time. I will just say that your understanding of how economists use the terms like savings and investment is simply not accurate. No. your error is simple. You are denying the correctness of accounting identities. Where one firm pays another for goods to be produced and delivered in the future, the treatment under national accounting principles is that this is neither saving nor investment, but simply an exchange of financial assets. The spending firm has a reduction in cash and an increase in advances as assets; the receiving firm has an increase in cash and an increase in advances as liabilities. No expenditure or income is recorded (and therefore no saving) and all movements take place across the financial account. This sort of detail doesn’t generally figure in economic models, although there’s no reason in principle why it couldn’t. Either way, I don’t see any injection here. If I pay you to mine valuable rocks and cut down valuable trees – that output becomes my investment and your income. That’s income accounting. If I pay for that with a new bank loan, that loan becomes my debt and the money it creates becomes your bank deposit. The debt is both my liability and the bank’s asset. The bank deposit becomes your asset and the bank’s liability. That’s flow of funds and balance sheet accounting. It consists of two sets of double entry bookkeeping (which some have called quadruple entry bookkeeping). Given this transaction on its own, you have saved your income. That is because you haven’t bought anything. This result holds on a standalone basis. It’s also why investment and saving are two different things in a monetary economy and why the quantity of investment equals the quantity of saving at all times. From a causal perspective, investment creates saving. Not vice versa. The accounting entries are more or less simultaneous, but the logical causality is clear – without the action of investing, there can be no saving. And there can’t be saving without logically precedent investment. Investment is a realized injection. Saving is a realized leakage. Both must occur together or not at all. And both are equal in value. The inherited economics terminology of injection and leakage is therefore weak and misleading. This is just a case of poor semantics. But being dealt that hand by the textbooks, we are left to carve out the correct context and interpretation of these ideas if we are asked to do so. Increasing the water level is an injection (investment). It must be accompanied by a leakage of the same absolute value in order for the analogy to be useful. That’s where your chosen analogy fails. That’s why I modified the analogy and adapted it to what happens in an accurate model of investment and saving. The association of the faucet exclusively with injections and the drain exclusively with leakages is just a false analogy. The faucet provides positive injections. But injections are accompanied logically and materially (in referring to investment) by equivalent value leakages (in referring to saving). The water level increases when I pay you to mine valuable rocks and cut down valuable trees and pay you corresponding income – at a pace that is greater than was previously the case. This is an increase in the level of economic flow. Economic activity in the form of investment and saving increases, and the water level rises. It drains when I no longer do that at the pace at which I previously did it. That is a reduction in the level of economic flow. Economic activity in the form of investment and saving contracts, and the water drains and the water level falls. That analogy works. Yours doesn’t. If this revision to your analogy seems awkward, it’s because you chose the bathtub analogy to start with. I wouldn’t have chosen it in the first place, because it requires such an awkward revision in order to make it feasibly correct. It’s simple. The analogy is wrong when the accounting to which it associates is wrong. That’s why the analogy should either be corrected (which I’ve done) or abandoned altogether (which is the better choice). I only modified it because you started with it. In the economic sphere, Injections reflect investment and leakages reflect saving. Your physical bathtub analogy associates injections with turning on the faucet to increase the water level. It associates leakages with the opening the drain to decrease the water level. That is a false analogy. It doesn’t work. Injections are associated with turning on the faucet to increase the water level, as is the case with your version. The increase in the water level reflects an increase in the level of investment. That becomes an increase in the level of saving by identity. And an increase in the level of saving is a leakage by terminological construction. So the leakage is also an increase in the water level. That forced modification is necessary in order for the analogy to have any valid meaning. And I played with that further (i.e. the bathtub wall/water level isomorphism) just to make the point of a required modification. So injections create corresponding leakages. Therefore, in this revised analogy, leakage does NOT mean a drop in the water level. Leakages instead are an increase in the water level, corresponding to an increase in the level of saving. This matches injections, which precipitate the increase in the water level, corresponding to an increase in the level of investment. This must be the case because saving equals investment at all times by inviolable accounting identity and real world accounting entries. And this adjustment to the analogy is necessary in order to reflect how saving relates to investment in the real world. Leakages are not the opposite of injections. Leakages are different in substance but equal in quantity to injections. The opposite of an injection is a negative injection. The correct algebra and accounting forces this rather drastic reinterpretation of the bathtub analogy. Given the difficulty of the modification, it is obviously a poor analogy from the start. It can be rescued from death in this way, but would be better put out of its misery. Ramanan, Sorry, but you are misunderstanding me. I don’t say that accounting identities are not correct; I say that accounting identities are incompatible with the basic theory of income determination underlying the simple Keynesian model, and others as well. Those accounting identities do not reflect necessary attributes of the real world, they are conventions – indeed, highly useful conventions – that have evolved to serve certain purposes. In particular, these conventions suppress certain naturally occurring lags between expenditure on final goods and the initiation of production processes and the payment of income to factors of production. Because conventional accounting identities do not allow for these lags to be taken into account, a theory of income determination is justified in adopting alternative conventions, and defining key variables differently from standard accounting definitions, so that these naturally occurring lags can be accommodated within the theory, thereby enabling the theory to achieve its purpose of explaining how income changes in response to specified parameter changes in the model. Thank you for succinctly articulating the key point at issue. To achieve the goals of accounting, accounting principles adopt certain conventions about how to treat certain transactions. I have no problem with accountants’ following those conventions when they are doing accounting. But I am arguing that those accounting conventions are not appropriate in the context of a model of income determination, specifically because they suppress the inherent lags between spending, producing and earning that are relevant to a theory of income determination that can explain how income changes in response to specified parameter changes. Those lags explain how the circular flow of income, expenditure and output that I am talking about can vary over time, by allowing for injections and leakages to occur sequentially in the circular flow that cause the magnitude or rate of flow to change at specific points in the flow. But in real life the payment and the productive activity and the earnings do not necessarily happen simultaneously even though in accounting terminology they are — by convention not physical reality as it unfolds in real time — all entered simultaneously. The economic model of income determination tries to accommodate in some fashion the natural lags of real life, while accounting principles, for perfectly good reasons from the perspective of the accountant, disregard those lags or define them away. That’s why when you try to put the simple bathtub model into accounting terms you come up with an explanation that is blatantly at odds with the obvious physical reality of the situation. The distortion of reality is somewhat less apparent in the context of the economic model, but it is still there. The payment of income to labor is a debit to the firm’s equity and a credit to labor’s equity. It’s simultaneous because its double entry bookkeeping. Nice reply. Incidentally, I avoided going into discussion about the bathtub as Nick and JKH have analysed your post in much more detail than I could have, so I decided to use a different approach. But there is no issue arising out of lags in models which use a lot of national accounting methods. These can easily be handled. You seem to be getting inconsistencies as the models you use themselves are incorrect. Accounting is not the villain there. All said and done, macroeconomic concepts are concepts of national accounting. Debt, deficit, production, income, expenditure, balance of payments: all are accounting concepts. I don’t see any issue in introducing lags with stock and flow variables in a model. There are “stock-flow consistent models” which do it. Now you may have issues with them but the points raised here in these series of posts don’t apply as a valid critique of these. An “injection” in the form of an increase in investment cannot occur without a “leakage” in the form of an increase in saving. There is no such sequential differentiation in reality. Just in the chosen bathtub model. If its an exchange of assets, there is no primary income effect. What are those financial assets exactly? I’m not clear on this. Given that there is no primary income effect, what does this example illuminate for the income model? JKH, But the expenditure on investment happens before any production is started or income is generated. Ramanan, I don’t know what you are referring to when you say that models I use are themselves incorrect. Please specify the model and specify the error. Otherwise, what you are telling me is without significance. I am saying that there can be a lag between expenditure and income and between savings and investment, but I am being told that those lags are not possible because such lags violate accounting principles. I didn’t make that up, that’s what I was told. If that’s wrong argue with those who are telling me that’s what accounting principles say. The error is straightforward. You yourself say that accounting is inconsistent with the model. But since accounting is right, you are forced to conclude that the model is wrong. QED. Lags do not violate accounting principles. You have to know accounting correctly. I suggest the SNA 2008 guide. Ramanan, Forgive me for being so blunt, but you are not even making an argument; you are just reciting a catechism. I have a comment for JKH on accounting principals applied to the simple model Richard Lipsey described last week where firms incorrectly anticipate consumption. If you apply accounting principals to that model you would see that investment gradually declines over time and (therefore) so does savings (defined via the identity). “From a causal perspective, investment creates saving” as he says above. But that doesn’t capture what is really drives that model, where people decide to increase “savings” (money stuffed under a mattress) and reduce consumption, which leads to firms reducing investment in response and so on, down to the equilibrium where there is no investment at all, and the entire stock of cash is held as “savings”. Undoubtedly there is a necessary concept in accounting called savings that is defined as Y-C and will always match and be driven by I . But (no matter what you call it) in this model it is “savings” defined as something like “cash holdings by households not allocated to consumption” that may not equal I (or Y-C) , plus behavioral assumption about firms investment decisions that are needed to see why I falls through time. Fine be blunt. I am also being blunt. My argument is simple. Your error is simply confusing accounting identities. There’s no catechism from my side: I have simply provoked you to say explicitly your view about accounting identities and caught you erring. How is that not being good at debate? And it’s not a small point. We all make mistakes. But your entire series of post revolves around this point. There is an exchange of financial assets. I assume those assets are money and an order for capital goods. At that point, there is no expenditure and no primary income effect. The purchase of a financial asset is not an expenditure in terms of national income accounting, and no factors of production have yet been paid to produce real output, because there is no real output yet. Money is just a financial asset – not real output. So nothing has actually happened yet other than the financial asset exchange. The vendor has a liability to deliver a capital good in the future, and an asset in the form of a bank deposit ready to make or order the components for that good. But the expenditure has not occurred yet, because it is just an order. Maybe we should try putting some meat on the bones. Consider the example, very simplified, of American Airlines ordering new jetliners from Boeing or Airbus. The example is a little odd, because it is very unlikely AA would prepay the entire amount before production has even begun. But that is a detail. What really is happening is that AA has made a loan to Boeing. It is an exchange of money in return for delivering a plane of equal present value. Again, this is just a form of financing. There is no real effect at this precise point. Of course there is a real effect expected in the future because of the order. But it is the manufacture of the plane that is the real investment output of the economy. And that hasn’t yet started. So if we are going to talk about injections, let’s just wait until that real output starts to get produced in the form of components. The order for the plane is really part of the “planning” dynamic that gets introduced into the model language. As I understand it, your bathtub model is not a model of planned increases in the water level. It’s a model of actual increases. The actual economy moves ahead one accounting entry at a time. btw, according to my construction of that example, that prepayment to Boeing or Airbus does not constitute revenue to them and has no immediate effect on profit. The reason is that the cash received is offset by a liability of equal value – the obligation to deliver a plane in the future. So the net equity effect is zero. This prepayment is only a balance sheet transaction. It is not revenue to Boeing or Airbus, which would have gone directly to the income statement instead, had that been the case – but its not. the assets is transferred from their producers to their users. inventories of finished product ready for delivery or sale. distributed over the entire period of production. It is unavoidable that economics encounter real world accounting logic and facts in its work. It is not the role of accounting to explain economic behavior. That is up to economics. But it is not the role of economics to build economic models of behavior that are founded on the mangling of real world accounting logic and definitions. Instead it is the obligation of economics to explain economic behavior by intersecting intelligently where necessary with real world accounting logic and definitions. The accounting piece is a foundation. It’s up to economics to build its behavioral models on top of that foundation, so that they don’t collapse in an implosion of real world incoherence. What you describe in your Boeing example is pretty much what I meant. I agree there is no primary income effect. The only movements are in the financial account. The financial asset that is created is (I believe) labelled an advance in SNA terms. In terms of relevance to models of income determination, one way this might come in is through expectations. When the buyer places the order, it influences the seller’s expectations of future sales, which will effect decisions about production levels. Ramanan – I think the stuff about work-in-progress is not relevant to this example, as this is a situation where there has been payment but no production – not even half-finished goods. Certainly agree on expectations, but I think there’s a stronger force at work in front of that – which is that the empirical comparison of the order flow with that of prior periods gives a type of de facto information which is a bit stronger than expectations, or at least is an elementary contractual level of expectations. If the order flow is increasing compared to previous periods, that part of the economy is already starting the process of expansion – PROVIDED that orders are realized as contracted. And that is a pretty direct signal on income developments. It’s a forward contract for production, which is a stronger mode than mere expectations I think. Expectations may then come through additionally in the form of expected future order flow. Of course, forward contracts can always fail due to risk – but most are fulfilled. I guess I would quality your point to Ramanan by saying that some of the components which are needed to satisfy an order for a capital good such as a plane may already exist in upstream inventory and upstream sales of even more upstream inputs that went into the production of that inventory. So the value of some of the input may already exist as investment and have already resulted in income. From there, an incremental investment effect beyond that of those already manufactured inputs will constitute a new investment ‘injection’. Of course, to the degree that upstream firms with inventories respond to that new order flow, additional upstream ‘injections’ to replace their inventories may be forthcoming as a knock-on effect. All that said, the net effect on increased economic activity over time will likely be as you suggest, provided the expansion mode is being sustained. It’s more realistic and it includes the case where there’s no work-in-progress. I am stepping into this very late, and I have basic question. I believe that for a particular definition of savings (S) and investment (I), you can derive from the national accounting identities that S=I. Therefore, in all states of the world (in which the accounting is done correctly), measured S will always equal measured I. Are you disputing the validity of the “accounting algebra” that leads to S=I? Or are you replacing the definitions of “S” and “I” to be something other than what are measured values (e.g., expectations, planned, etc.)? Or are you substituting definitions (“S” is personal savings, not national savings)? You may have addressed this question, but I did not see it. Thanks. Depending on what the goal of the analysis is, one may want to focus on the initial payment as an expenditure of cash by the buyer, and say that there is a lag between expenditure and output and income, and from another perspective one may want to treat the payment as a simple exchange of financial assets. There is a semantic choice to be made, and the choice will depend on the context. All I am saying is that from the perspective of a theory of national income, the accounting identities you insist on are not useful, and it is better to treat expenditure and income and output as non-identical and allow for lags in real time between the moments when these events occur. The actual economy moves when economic agents transact with each other and engage in productive or consumption activities. Accounting entries are a written representation of those activities, in a specialized language. Accounting entries are not identical to the actual activities of which they constitute a numerical representation. I don’t understand why that even needs to be stated, but evidently it does. The prepayment by American Airlines is made only once. You are saying that that payment is not an expenditure, because under accounting conventions is classified as a balance-sheet transaction. But eventually, under accounting conventions, it will be reclassified as an expenditure, when according to the accounting conventions, it is appropriate to reclassify it as such. So, based on accounting conventions, you are insisting that a direct payment from buyer to seller must first be classified one way and later reclassified in another way. But, in reality, there is just one payment, and from my perspective it does not seem to me to misrepresent reality to just call it an expenditure from the get go under the definitions used in the macroeconomic theory of income determination. Note that I am not saying that the definition of the macroeconomic theory of income determination are right and the accounting definitions are wrong, I am just saying that, depending on the context, one set of definitions may be more appropriate than the other. Brian, The identity between savings and investment is derived from an identity between income and expenditure. The identity between income and expenditure is based on an accounting convention, which the payment of funds is classified as an expenditure only when there is a transfer of goods, or when production starts. If instead we classify expenditures as such when they take place, and output when it takes and the payment of incomes to households when they take place and recognize that there are lags between those payments and the production of output, the accounting identities don’t hold, and savings and investment may not be equal. One set of definitions is not uniquely correct – and by the way, there are many alternative accounting conventions that could be adopted – the choice of definitions should be determined by the objective of the analysis that one is trying to undertake. Your argument is not at all simple, because you won’t specify the accounting identities that have been confused. You just assert error and claim that accounting identities are sacrosanct and trump all other considerations. Please specify the error, rather than just repeating the allegation. If the error is that I don’t accept that accounting identities trump every other possible definition, then that is just an assertion of accounting supremacy on your part, not an argument. But it occurred to me that the best way to explain why saving is not identical to investment is by framing the discussion in terms of the familiar circular-flow schematic model of income and expenditure. in short you are confusing “final purchases” with “expenditure”. These two differ from each other by “change in inventories”. Expenditure = Final purchases + change in inventories. Again erroneous and gross misunderstanding of definitions of national accounts. The accounting identities hold at all times. I cannot be more pin pointed than that. Sorry if this is blunt, but it’s as straightforward. But I’ll leave it for now as we seem to keep saying the same thing. I hope you realize your errors. C’mon. That’s such an immature response. You know full well what I’m referring to there. Measurement. Like a journey begins with the first mile … you know? The rather massive methodological error you are making in your overall analysis is that because of your obvious lack of familiarity with accounting structures, you don’t understand the difference between income accounting and sources and uses of funds accounting. And because of that you don’t understand that the concerns that are implicit in your objections to income accounting are fully captured in the information that is provided by sources and uses of funds accounting. A complete accounting treatment of any entity requires and must have a complete set of 3 different financial statements – income, sources and uses of funds, and balance sheet. And any information on lags or anything else you want is available through those kinds of financial statements when parsed to the appropriate time horizon. And any behavioral model you want to build can be set on this sort of coherent foundation for measurement. It is essential. And in that framework, for example, investment is always identically equal to saving in the most basic no government no foreign sector model. Everything you want to accomplish in terms of the type of economic analysis you’re looking to do here is doable using that established accounting foundation for purposes of consistent analysis and measurement. This is all standard stuff. Unfortunately, economists are not trained in it, even though it is essential raw material for their work. Hi – thanks for the response. I will have to take a look at your arguments. You are approaching this with a different framework, and I need to “translate” it into my way of looking at this. ”Either you state whether accounting identities are valid or whether they are not. You are saying both the things simultaneously. I am not denying that savings can be so defined that it is identically equal to investment. I am denying that there is no possible alternative definition of savings (in a closed economy) that allows savings to be different from investment. You therefore seem to be asserting savings and investment can be defined only in such a way that they are identically equal. You are free to keep asserting that proposition, but you have not yet made an argument for, much less established, that proposition. Simply invoking accounting definitions does not establish that are not other alternative definitions of savings and investment. And as an empirical matter, the assertion statement is flatly wrong, because Richard Lipsey in multiple editions of his various economics textbooks has for decades been defining savings in such a way that it can be different from investment. You are free to reject his definitions or his models, but you have not established that they are in error, you just keep asserting that they are as if that were sufficient to make it so. And in your latest comment, you continue to assert, without argument, that statements with which you disagree are erroneous. My reply to Brian was obviously not meant to offer a full set of definitions, but just to suggest the general approach that I am following; appropriate definitional adjustments could easily be made. JKH, Actually I do not know full well what you were referring to there, and your explanation “Measurement. Like a journey begins with the first mile … you know?” doesn’t help me figure out what you meant. But I apologize for not understanding you. You refer to a “massive methodological error” without specifying what the error is. I have no objections to income accounting, but the conventions of income accounting need not be adopted by a marcroeconomic model of income determination. And your insistence that accounting conventions forbid alternative definitions of income and expenditure and investment and saving from being adopted in macroeconomic models seems to me to be a pretty substantial methodological error in its own right, as it presumes that there is and can be only one correct definition of any term for which there is an accounting definition. Brian, You’re welcome. Looking forward to hearing from you. Do you not see the inconsistency in your own statements? You started off with saying accounting identities are valid for all states of the world. Then you tried to sneak in a proof to say otherwise. Then when pinpointed, you say both identities and the model are not consistent with each other. Then in the latest but one say accounting identities are not valid because of lags. And now this!! What a straw man. That’s not my point. My point is that you keep asserting that saving is different from investment and that the standard definitions are inconsistent. Your error is to mix your own definitions with standard ones and keep them vague to allow you to get away with anything you want to claim. And you write claiming both X and notX. When I take issue with X, you simply quote yourself saying notX. In the comments I did say that you can have alternative definitions. But what are those? All I can see is confusing standard definitions. But let’s just say you have a system of accounts where definitions are different and saving is different from investment. I can do a mathematical transformation to a new set of variables in which standard identities hold. What is the point of writing so much? Absolutely nothing. There is no need to change definitions. National accountants have worried since a century about the self-consistency of their approach. With some exceptions, I see the ones who complain about definitions are the ones muddling with it. To add further, when I say there is no need to change definitions, I am not saying it is not possible at all. I am just saying it is a worthless exercise and also that your errors are to confuse alternative/self-invented/vague definitions with the standard ones and not being able to cleanly distinguish them. The best thing you can do is to go through national accounts guides/framework in detail and check for yourself that there are no self-inconsistencies. jkh the quad-accounting system did not recognize the first move – and that is where this all fails. You say this: “If I pay for that with a new bank loan” than point out quite properly in the system you THEN define you can account in two double-entries. BUT – where did the bank get the money to make you the loan in the fist move?? It is called endogenous money – ex nihilo by the bank and that is what makes the flow. DG – What still bothers me as a political scientist/economist is the diagram misses the point that at Time zero (the way I want to talk about the flow) the term Savings consists of a choice of sending some of this over to fill in the Investment in-flow (along with endogenous money) while the remainder is held as stock/wealth. So can we add Endogenous money in, and arrow connecting Savings to Investment and add in W representing those things held out of the flow as Wealth. Net Wealth in the US exceeds $83 Trillion but the economy’s flow is only around $17-18 Trillion. It seems pretty clear to me that the term investment and the term savings – well, they need help as definitions. And it also seems clear to me that economists get hung up only talking about flow and completely miss the W side of this – and why do they miss this? and why do they also miss the idea that the traditional bank entity has by definition the ability to create investment flow from nothing – and why is that ignored? The political-economist might say that is why economics was called political-economy, ignoring the politics of defining systems and defining definitions that help obfuscate such real things as endogenous money and Net Wealth, is not helpful. But I really enjoy this thread as it is highlighting a weakness in some analytic frameworks that need to define things so they have cloture (but obfuscate instead). Or maybe the word is “spotlight” people can see things better when better light is shown on the matter – so encourage this a lot. This entire debate is 90% about definitions of terms. I realise that my definitions are different to yours. That’s why I wrote my comments. It is the differences in definitions of terms that lead directly to different conclusions. That’s not true just of me and my definitions. It’s also true of you and your definitions. And it’s true of anyone else reading or commenting on your posts. There are only two sensible outcomes for these discussions. The first relies on a common set of definitions and assumptions, and the logical conclusions which derive from the common definitions and assumptions. The second is to agree to differ on definitions and then to agree that discussion of conclusions is futile. My basic assumptions in this conversation are that physical goods and materials are subject to the conservation laws of physics; that financial assets are subject to the conservation laws of accounting (i.e. financial assets are always offset by equal and opposite financial liabilities – like matter and anti-matter); and that accounting must account for everything very specifically and very pedantically at all times. I define what I mean by the terms in the C + I = C + S identity in my previous comment. I am not clear on your assumptions. I am also not clear on your definitions of the terms in the C + I = C + S identity. I am sure that you are frustrated by my comments. I have been frustrated for at least five years in reading about this stuff where it is obvious to an outsider that different economists use different definitions of the same terms and then expect to have a debate which leads to shared conclusions. First, a business digs a volume of a commodity out of the ground. This requires labour. The payment that the business makes to households for their labour becomes their income and (in the absence of further spending) their saving. In return, the business has an inventory of the commodity which is can sell. The inventory of the commodity IS the business’s investment. The business values that investment at cost. The cost is the cost of the labour so is identical in value to the saving of households. Second, this business sells its inventory of the commodity to a second business which will use the commodity in the manufacture of something. In investment terms, the first business’s inventory of the commodity reduces to zero in volume and value. The second business’s inventory increases by the same volume amount. However, the second business values the commodity at the price it paid (which would be the first business’s costs plus the first business’s profit). The value of the second business’s inventory will be higher than the value that the first business placed on the inventory due to the incorporation of the first business’s profit. Hence, the thing you call the lag between the purchases by a business and its sales IS the investment. That’s why accountants need the concept of investment. The problem here is that economists use the term investment to mean both a flow of money and a valuation of the goods and services purchased by businesses with money. This is not consistent and is one of the problems you have here. That’s why I redrew your diagram in my previous comment. How much of net worth was converted to an Investment in 1980? How much was converted to consumption instead, and how much was left where it is now? How much of a person’s net worth change comes from mark-to-market changes (stock price goes up for any reason; house price goes up for any reason; how much came because I bought with one currency but sold in another with currency gains; net of losses), all of these changes having nothing to do with production at all? Precautionary and basic savings are held out of net worth at a rate exceeding 25% (2005 FRB paper), while most Americans are under-saved at the personal level. So two things limit how much can go from the Income-Consumption ‘savings’ to Investment, one because 95% of US residents don’t even meet the basic threshold to have excess, and obviously, it is only the excess held predominantly by the 95%+ who can chose to Invest or Consume this wealth. And of these 5% of people who have this ‘marginal’ choice to convert wealth to consumption or investment have been increasingly investing it outside the US economy, including into the financial asset marketplaces (which are significantly managed by non-US systemic-banks). Sorry, but I think the idea of some simple identity between investment and savings – is bunk, and am very glad to see people weaken the over-rationalized use of the ‘accounting’ definitions for NIPA purposes then used to justify economic and taxation policies that favor Savings and Investments (because, oh no, we don’t have enough of it, the system won’t flow, the sky is falling). NIPA is a ex-post system of books it seems to me, so there are definitional rules to establish cloture, there just are, no dispute on that basis – and NIPA has great analytic uses. But NIPA views should not be over-used, and those who use it should speak out LOUDLY against its misuse for rent-seeking policy-making results/purposes. And the bottom line to me, the debate-clip provided by W.Peden says it, and Tobin says it, and it is absolutely known that banks create money – so we can NEVER run out of investment funds (as long as you are willing to pay the bank’s terms) and this is just not the same thing as personal savings or even profits from the flow of things in a period, and we need to be careful not to imply there is any identity in these things at all. So keep it up – debunk some of the use of these definitional expressions. Or – I could learn a lot!! Soryr, didn’t complete one sentence. The point was for people to recognize that starting with wealth you need to recognize that some of it is converted to flow outside your defined system (and this has been changing). And the FRB paper about savings actually says 20% (but refers to other studies that have seen highs of 50% precaution). Just went too quickly here, no intention to mislead. Good description of bottom up cost accounting proceeding to aggregation. Some reflection on this construction process will assure that in a simplified, no government closed economy, where the two categories of output are C and I, that C + I = C + S and I = S identically and under all circumstances. There is no other way to proceed. 99 per cent of the blogosphere, bloggers and commenters, don’t get this – or how critical it is to telling coherent stories about economics. I’ve just gone through the previous posts on this topic searching for the term “inventory” and would like to highlight a comment by Richard Lipsey with which I agree, as it is an example where the identity is broken. Note that Richard is agreeing that inventory is investment. However, in the example I posted earlier about a business mining a commodity, my assumption was that businesses value inventory at cost. Richard’s comment is based on breaking that assumption for national accounting purposes. If the inventory is revalued at anything other than cost then the identity would not hold. If the business spends 100 on its investment then the rest of the economy will earn (and save) 100. However, if the inventory is then revalued to 110 then the identity will not hold as the rest of the economy will still have saved 100. This shows that it is vital to document all assumptions in these arguments. The same point is true if a final product is valued at anything other than purchase price after it is purchased. I just posted a reply to Ramanan’s comment of March 22, but decided to delete it, because it replied in kind to certain offensive remarks in his comment. After a couple of minutes reflection, I concluded that it would be a waste of everyone’s time to continue that conversation. I am now going to concentrate on my next (and I hope final) installment in this series which I hope to post tomorrow or the day after. In the meantime, I will not be responding to any more comments on this post, but we can continue discussing the issues in the comments to the next post. FWIW, IIUC, the tub analogy is inappropriate. We are not concerned with any reservoir, but merely with following the flow of money through the system in trade for new goods and services. Because that is all that we are doing, we get accounting identities. There is no tub in between. Or if there is, we ignore it. If I buy some stock, I may call it investment, but we do not count it as investment in the schema. We ignore it (except for fees and so on). Ignoring something is not the same as maintaining an equilibrium. In fact, the economy does not have to be in equilibrium at all for the identities to hold.